‘The Garden of Evolution’ is an interactive installation, originally shown outdoors in Dundee Botanic Gardens in May 2016 and recreated in this space in the form of an indoor garden. 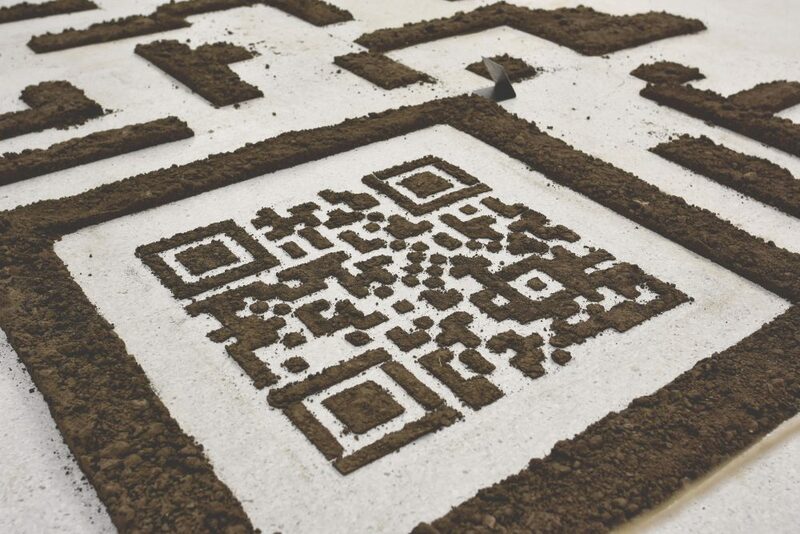 The QR codes work as connectors between the physical and the digital worlds, augmenting reality and bringing an additional layer to the life of the garden. The viewers are called to scan them in order to decrypt the sound pieces hidden inside them. This hybrid ecosystem investigates the relationships we develop with our mobile devices as everyday users but also as spectators of art. It deals with the way digital technologies change our perception, enhance and displace our senses and re-shape our interactions and communications as we become increasingly more dependent on them to a level that they become our new nature. Born in Athens, Greece, Lily Hassioti is a new media artist who works along a variety of materials and processes, creating interactive installations. Graduated from Duncan of Jordanstone College of Art and Design in May 2016 with BA (Hons) in Fine Art, she was awarded the John Kinross scholarship to Florence by the Royal Scottish Academy and has been a studio holder in the Edinburgh Sculpture Workshop. She has exhibited work in the “New Contemporaries 2017” show in the Royal Scottish Academy, Edinburgh, “Paradigm Electronic Arts” 2016 in Summerhall and “Ignite Festival” 2016 in Dundee. Alongside her independent practice, she has curated and co-organized various shows and workshops in Dundee and Edinburgh (“In Transit” 2015, “Projectile” 2016, “Cave, after Plato” 2017 etc). Lily Hassioti looks at the social, cultural, and emotional impact that the rapid development of digital technologies has on our everyday life. As these advancements blend with our surroundings to create an unnoticeable Internet of Things, Lily discusses the artistic, aesthetic and ethical concerns that arise in these digitally infused environments. Lily’s work is transitory or ephemeral, foregrounding human presence and inviting interaction in order for each piece to be complete.